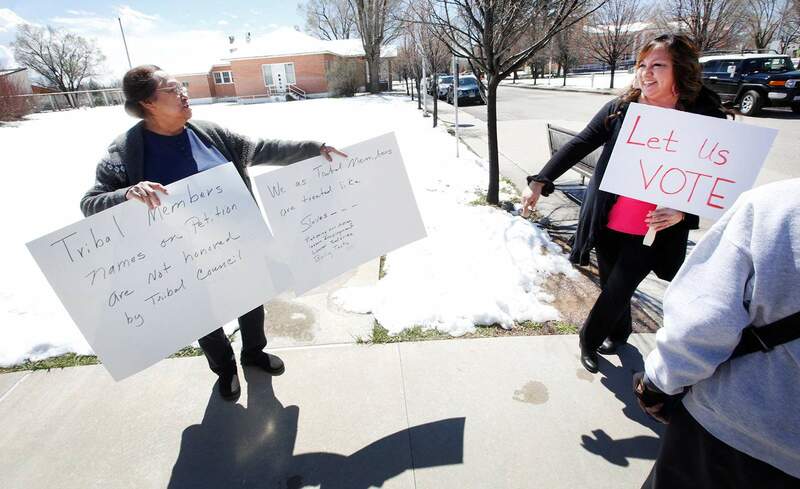 Southern Ute tribal members Judy Lansing, left, and Dedra White, among others, held signs Tuesday in front of the Leonard C. Burch Tribal Administration Building. The protesters were asking Tribal Council to hold an election to let members decide if millions of dollars should be kept by the tribal government or distributed to members. 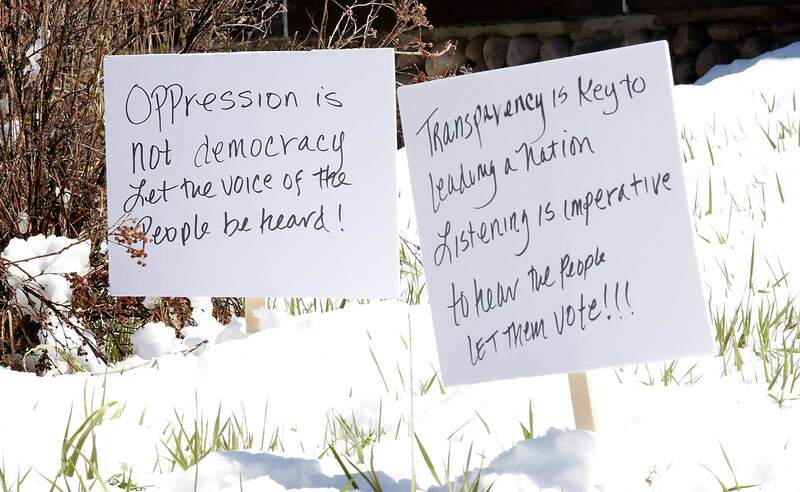 Signs were placed Tuesday in front of the Leonard C. Burch Tribal Administration Building by tribal members asking for an election to be held to let members decide whether millions of dollars should be kept by the tribal government or distributed to members. IGNACIO – After months of infighting, Southern Ute tribal leaders agreed Tuesday to hold a special election that will allow members to vote on whether millions of dollars should be kept by tribal government or distributed to tribal members. The conflict stems from a $126 million lawsuit settlement in the tribe’s favor and what should be done with the funds. The tribe distributed 60 percent of the funds to its approximately 1,500 enrolled members, but some members want the remaining 40 percent – or at least a vote on whether the full amount should be distributed. Tribal members submitted a petition Feb. 13 with 218 valid signatures – 33 more than needed – requesting a referendum election be held. Tribal leaders tentatively scheduled an election for March 16, but later canceled it, saying the petition was invalid because it included more than one issue and didn’t address an existing or proposed resolution/ordinance before the council. “The petition attempts to legislate how tribal funds are spent, and those are powers that are exclusively reserved for Tribal Council as stated in the constitution,” Tribal Council wrote in a March 3 letter published in the Southern Ute Drum, the tribe’s newspaper. Members turned in a new petition, which was taken up Tuesday by the Tribal Council. The Durango Herald tried to attend the meeting but was denied entry. But this time, Tribal Council drafted its own resolution directing an election be held May 4. A tribal spokeswoman did not respond to requests seeking comment Tuesday afternoon. The Southern Ute Indian Tribe received the $126 million settlement in September to resolve a lawsuit accusing the federal government of mismanaging monetary assets and natural resources held in trust by the United States for the benefit of the tribe, dating to the late 1800s. Dozens of other tribes filed similar lawsuits, known as the Sisseton lawsuits, that alleged improper record-keeping, incorrect interest rates and other historic claims related to mismanagement of Indian resources. The tribe distributed 60 percent of the settlement late last year or early this year, after attorney’s fees. In a letter to members, Tribal Council suggested it wanted to use the remaining funds to pay for a long list of services and programs, including health care, education, housing, employment, new investment opportunities, financial literacy, economic development, repairs to an irrigation project, enhancing museum and cultural resources, records management, youth services and recreation. About 10 protesters gathered outside the tribe’s administration building about an hour before Tuesday’s Tribal Council meeting. They held signs, including some that read: “Let us vote,” “We are not children,” and “Tribal members’ voices are not heard by Tribal Council.” About six law enforcement vehicles circled the parking lot during the demonstration, including officers for the Southern Ute Tribal Police, the Southern Ute Tribal Rangers and the La Plata County Sheriff’s Office. In fighting their case, tribal members accused tribal leaders of acting in secret, ignoring the will of its people, violating its own constitution, intimidating members who speak out against the tribe, and wasting millions of dollars on bloated programs and services. Davis said Tuesday’s vote is a win, but much work remains in reforming tribal government. Too many jobs are awarded to friends and family of those in power, she said. And tribal councilors are overpaid and care more about their paychecks than serving the membership. “The favoritism needs to end, the nepotism needs to end,” Davis said.